Imām ʿAlī (May Allah honour him) is a cousin of Prophet Muḥammad (prayer and peace of Allah be upon him). It was Imām ʿAlī’s father, Abū Ṭālib, who took custody of the orphan Prophet (PBUH) after the death of his grand father. Imām ʿAlī [karrama Allah wajhah] is the only person to be born inside the Kaʿba, in Macca. He was born in 599 CE. Imām ʿAlī’s mother named him “Ḥaydara” which means “lion”. But it was Prophet Muḥammad (PBUH) himself who gave him his most known name. He held the newborn high and said “ʿAlī” which means “high”. About thirty years later, during the conquest of Khaibar, the Prophet (PBUH) conferred on Imām ʿAlī another of his famous titles, “al-Karrār” which means “the attacker”. The Prophet (PBUH) took Imām ʿAlī into his custody from his early years. 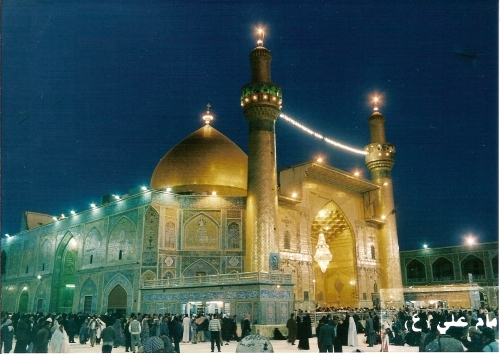 Having been brought up by the Prophet (PBUH) himself, Imām ʿAlī acquired his qualities from the unique great qualities of his Master (PBUH). Following his great Master (PBUH), Imām ʿAlī never worshipped an idol. It is due to this and the Prophetic tradition: “Looking at the face of ʿAlī is an act of worship” that Imām ʿAlī’s name is usually followed with the special phrase “karrama Allahu wajhah” which roughly means “Glorified is his face by Allah”. Imām ʿAlī was the first to embrace Islam and to perform prayer. Imām ʿAlī was so loved by the Prophet (PBUH) that he married him to his most loved daughter Sayyida Fāṭima az Zahrā’ (peace be upon her). That Imām ʿAlī was the closest person to Prophet Muḥammad (PBUH) is an indisputable fact. The Prophet appointed Imām ʿAlī as his deputy when he was still very young. He left Imām ʿAlī in Macca to return to people what they had entrusted to the Prophet (PBUH) when he emigrated to al Madīna. He also named Imām ʿAlī as his spiritual heir. He would often say about Imām ʿAlī : “I am the city of knowledge and ʿAlī is its gate. So he who wants to enter the city must go through the gate”. The Prophet (PBUH) here refers to the spiritual chain of the Shaikhs of Ṭarīqa which continued through Imām ʿAlī to this day. Through this and so many other sayings, the Prophet (PBUH) taught the Muslims of all time that if they wanted to be close to him and follow him, then they must follow Imām ʿAlī who is the spiritual gate to the Prophet (PBUH). The life of Imām ʿAlī (Glorified is his face by Allah) is full of miracles that attest to this unique spiritual status. Language fails to capture all the excellent qualities of Imām ʿAlī. One of his most renowned attributes is his unparalleled courage. Due to this courage, Prophet Muḥammad (PBUH) called him al-Karrār, a title that he conferred on Imām ʿAlī before the battle of Khaibar in which Imām ʿAlī played a major role in the victory of the Muslims’ army. Allah made the courage of Imām ʿAlī a crucial weapon in supporting and establishing Islam and giving Muslims the upper hand over their outnumbering enemies who launched a lengthy and brutal war against the new religion. Imām ʿAlī lived a life of non stop inner and outer struggle for the sake of Allah, that is struggling against the lower self and the outer enemy, respectively. When Imām ʿAlī became the khalīfa, i.e. head of the state, at some point after the departure of Prophet Muḥammad (PBUH), he started his campaign to eradicate corruption and to establish the Islamic state on sound grounds. However, he was faced with immense resistance from those corrupt elements who had succeeded in gaining access to high offices within the Islamic state and who had bought with their stolen money so many followers. Imām ʿAlī was thus forced into a series of battles to purify the state from those who hijacked it for their personal interests. He was fighting for spiritual Islam in the face of persistent attempts to distort the real face of Islam and turn it into some form of a political system no more. As a result of his enormous efforts to establish justice and proper Islamic teachings, Imām ʿAlī was martyred. When he would be asked to avoid some dangerous situations he used to reply: “I am under an impenetrable protection from Allah. When the time [of martyrdom) comes, the sword will not miss [me) and the wound will not heal”. One day, while leading the prayer of dawn in the mosque, Imām ʿAlī was stricken from behind by a sword on the top of his head. As he had predicted, the wound did not heal. Three days later, thirty years after the departure of the Prophet (PBUH) from this world, Imām ʿAlī joined his most beloved Master (PBUH). For a glimpse of the greatness of Imām ʿAlī it suffices to mention that when he received his fatal strike with the sword, his immediate words were: “I have won [by becoming a martyr), by the Lord of the Kaʿba”; a unique response in that situation from a unique man of Allah. As Imām ʿAlī acquired the excellent qualities of his Master (PBUH), these unique qualities were inherited from Imām ʿAlī by his sons and descendants. This most sacred lineage became the symbols of patience, piety, justice and all good attributes and qualities. They became, as their grandfather (PBUH) had stated, the second foundation, beside the Qur’an, on which the edifice of Islam will stand firm to the Day of Resurrection.